Described in the book of revelations as the harbingers of the apocalypse, the Four Horsemen symbolize conquest, war, famine and death. Drawing upon this imagery, the 2012 documentary Four Horsemen directed by Ross Ashcroft examines the crisis facing the contemporary world and where our future may lie. 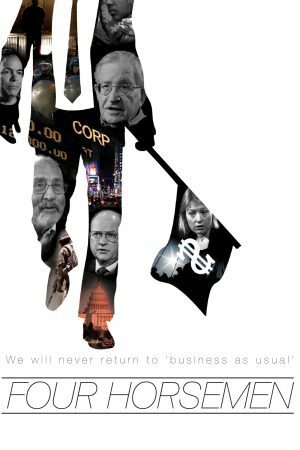 Focusing in particular on the fate of the 99%, who have suffered most during the recent economic problems the film brings together 23 of the greatest contemporary thinkers, including the likes of Noam Chomsky, Herman Daley, and more, to discuss a great number of issues, questions and topics. Perhaps the most important questions facing these thinkers is the re-establishment of morality and justice within a failed capitalist model. Is it even possible to restore order amidst such incredible sense of chaos and despair, in particular felt by the younger generations, who cannot hope to have the same comforts as that of their parents? Broken down into four different categories, Empires, Banking, Terrorism and Resources, these great thinkers – many of whom have been more or less exiled from the mainstream press – evaluated the situation from different socio-historical and political backgrounds. Not looking to sugar coat or use corporate-speak, they emphasize the potential gravity of the scenario and for many the crisis has literally become a matter of life and death. Unlike many other documentaries tackling the current economic crisis, this one attempts to offer real solutions for the future. Interestingly enough, the film is financed and produced by the filmmakers, “out of outrage, out of incredulity, out of necessity” having identified the eponymous Four Horsemen of the modern world that are continuing to “ride roughshod over the people whom can least afford it.” Taking aim at commonly held opinions about the nature of capitalism and the current financial system, the film is bound to be controversial and divisive but will no doubt be eye-opening. This is a film that challenges ideas and concepts about our contemporary world and pushes people to think deeper and fight harder for a better future.